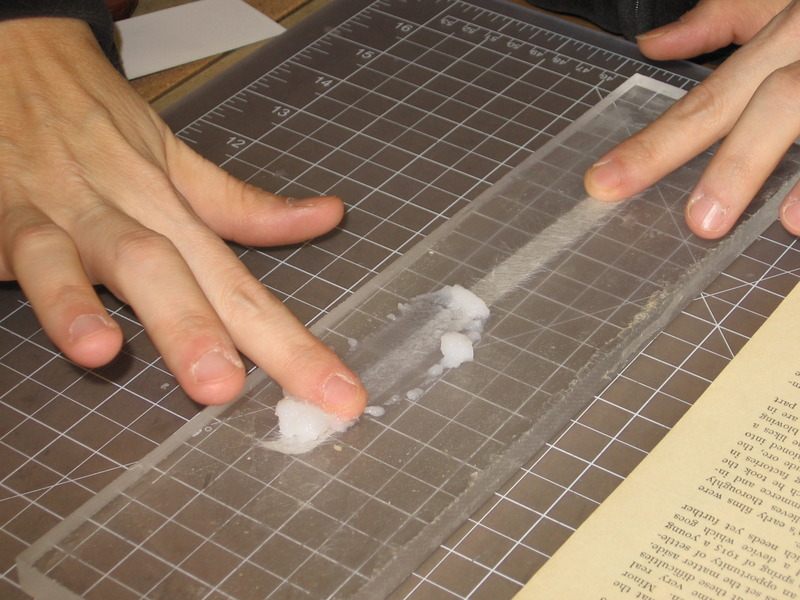 Wheat starch paste applied by hand to Japanese tissue for use on the repair of a torn book page. 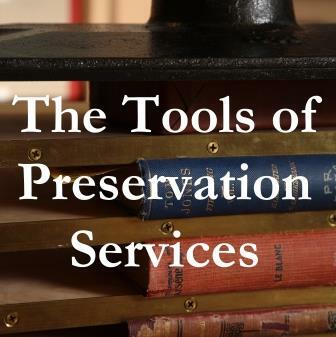 In the conservation of books, manuscripts, works of art, or any paper materials, one guiding principle is paramount: all treatments should be reversible. Years from now, perhaps when a cultural object requires additional care, previous repairs must not stand in the way. Adhesives, therefore, must be strong and flexible enough to function for decades, yet the application of an appropriate solvent should reverse adhesion without damaging the object. Adhesives must never stain or warp the object or decompose quickly. The three most common adhesives used in Preservation Services are specially prepared wheat starch paste, methyl cellulose, and Poly Vinyl Acetate (PVAc). Methyl cellulose and starch pastes meet all the criteria for mending library materials—they do not yellow, darken, or stain paper; they retain adhesive strength for a long time; the adhesion is reversible (you can undo repairs, even after a long period of time, without damage to the original library item); and they do not contain preservatives or chemicals harmful to paper, boards, leather, etc. Interestingly, everybody has eaten methyl cellulose. It is in fast food shakes, processed cheese, puddings, batters, sports drinks, some soups and sauces, processed meat, peanut butter, candy, etc., chiefly as a thickening agent. Wheat starch is also a popular thickener and extender, especially in baked goods, convenience foods, noodles, pie fillings, batter mixes, and breakfast cereals.